Nurses are the unsung heroes of the medical profession, the people who do all the little things, like sticking your arm, collecting your vitals, and generally making you feel somewhat more human when you're not at your best. 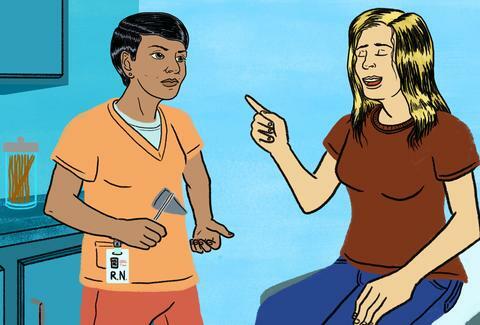 But since nurses tend to see people in times of distress -- and since they do their jobs right in front of you -- they have to deal with a lot of crap, both literal and metaphorical. Here are a few of the common refrains they're sick of hearing from patients, doctors, other medical staff, family, friends, and the public at large. Keep these in the back of your mind the next time you wind up on the wrong side of the hospital doors. Nurses often take the brunt of the blame when things go wrong, says Chris Caulfield, RN, NP-C. "Regardless of if the mistake was due to the doctor, pharmacist, physical therapist, or nursing assistant; hospitals like to blame the nursing staff for pretty much everything," he adds. Caulfield says that since nurses are the gatekeepers of all things medical and non-medical in the hospital, they often get blamed for the mistakes of everyone throughout the system, which is super crappy. "Oh, you're 'just' a nurse?" "I'm a student nurse and nurse tech (SN, NT) and the phrase 'just a nurse' is like nails on a chalkboard to me," says Heather Price. There is no "just" when talking about the nursing profession -- they do their job, like everyone else in the medical field. "Why aren't you a doctor?" Related to calling someone "just" a nurse. Eileen Sollars, RN, AAS, ADN, says she also gets asked why she didn't just become a doctor. It's a completely different profession, and if she wanted to be a doctor, she would have become a doctor. Why didn't you become a librarian instead of an accountant, anyway? "What did you do with my mom's teeth, glasses, etc.?" Bonnie Emery, RN, BSN, has had patients' family members come up to her, demanding to know what she did with their loved ones' items. For starters, she says, it's not always clear what family member goes with which patient, and next, she didn't take them in the first place. While she always helps them look, she says she wishes she could say something else instead: "What I'd like to say is that I took them home to put in my garage sale with the other dentures I've taken home." "Wow, why aren't you retired?" People actually pose this question to Sollars, who's been a nurse for 38 solid years. That's almost as bad as someone asking why you're not dead yet. "Hey, can you take a look at…?" Sollars also says that at gatherings or other events, people come up to her and ask for medical advice, or even worse, ask if she can take a look at whatever body part is ailing a person. No, she doesn't want to do this any more than any other person would want to do this. It's a party, dammit, she just wants some punch and normal socialization. Yes, you can do your own medical research, and often your medical team will work with you to come up with the best treatment plan. Sollars asks you to keep in mind that you're just an average member of the public using Google -- not a nurse, and not a doctor, so don't pretend you are. "So my friend is in the hospital, can you tell me all the juicy details?" Um, no… doesn't stop people from asking, though. Jolene Wilder, RN, unequivocally says no, nurses cannot tell you details about patients in the hospital. There's this little thing called HIPAA that prohibits (by way of federal law) disbursement of patient information, and even if HIPAA didn't exist, would you really want someone telling your friends your medical deets? "I have a high pain tolerance." "Really?" wonders Lisa Dukes, MSN, RN, CEN, CPEN, TCRN, an ER/trauma nurse. When she hears patients claim they have a high pain tolerance, she says (totally in her head), "No one does. Everyone just thinks they do." So leave your brag about pain tolerance at home; nobody will believe you anyway. "That must be so hard! I couldn't do what you do." Jamie, who works as a pediatric cardiac intensive care nurse, says that whenever she tells people about her job, they express the above. She says, "Um… that's why I do it and you don't. Yes, it's hard, but I love it and that's why I do it." While it seems harmless, it can get old hearing that your job somehow makes your total existence more difficult than other people's. More straightforward words of praise or admiration can accomplish the same goal. Monica Beyer is a writer and not a nurse, though she has a high pain tolerance, promise. Follow her @monicabeyer.